Meradelima Restaurant is a reflection of how two different cultures used to and still coexist side by side in perfect harmony. Commonly referred to as Peranakans, they are the descendants of Chinese immigrants who came to the Malay archipelago (which includes Indonesia and Singapore) between the 15th and 17th centuries. Peranakans are a unique heritage to Southeast Asia, an intertwining of the Malay and Chinese culture. 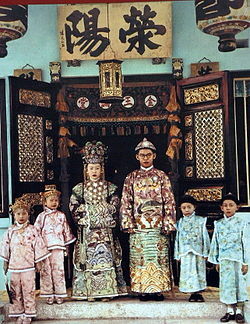 A Peranakan wedding couple (taken from Wikipedia). Meradelima beautifully embodies the vivacious and spirited Peranakan culture both in its design and cuisine. Housed in a two-storey building featuring Jengki architecture, patrons are welcomed into the restaurant by a red-carpeted wooden deck and servers dressed in red oriental cheongsams. One of the private dining rooms in Meradelima. On entering the restaurant, I felt as if I was transported back to a bygone era. The interior was decorated with vibrantly coloured Peranakan-style porcelain collections, vintage replica becak chairs, and exquisite kebayas encased in large glass frames. Our first visit – dining against the backdrop of intricately embroidered kebayas with floral motifs. According to the owner who was born and raised as a Peranakan, each kebaya is uniquely designed and the display stands as a tribute to the lives of Peranakan women of the past. An assortment of Peranakan-style porcelain ware. A set of stairs leads from the first floor of the restaurant to the upper floor. The decor of the second floor is equally enchanting. A pair of gigantic doors made of teak wood is fixed to the wall and inscribed on it are four Chinese characters (which I could hardly make out with my sad command of Mandarin). Since my dad is a full Baba (which makes me half a Nyonya I guess), I thought that he might like dining at Meradelima. And I was right. My parents loved the setting of the entire place. Our second visit – seated at the exact same spot. 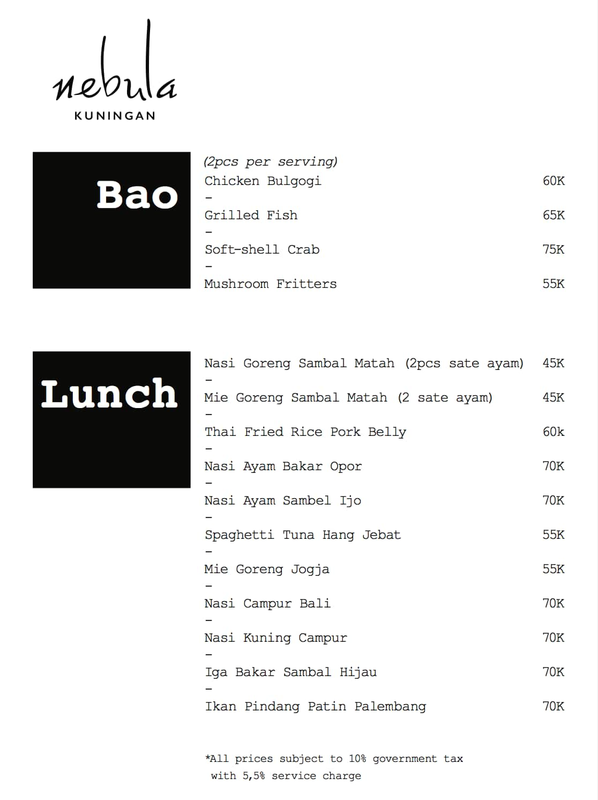 Food wise, their menu has a mix of Indonesian, Malay and Chinese food — thanks to the influence of the Peranakan era. Meradelima makes a lovely place for a family get-together or a private party. It is also a good place to take your tourist guests to. If you want to dine in privacy, there are various private dining rooms on both floors as well as an enclosed al fresco dining area. Spanish Tapas Gem in Jakarta: ¿Por Qué No? It has been about a year since ¿Por Qué No? (I shall just use ‘Por Que No’ for the purpose of easy typing) opened her doors to the public. Translated from Spanish into English, the name Por Que No literally means “why not?”. So WHY NOT check this place out! Por Que No on a quiet weekday afternoon. Huge signboard made up of colour pencils. Located on the topmost floor of De Ritz Building, Por Que No is separated into two areas — an indoor dining room and an outdoor lounge. The indoor part of the restaurant looks like a greenhouse, with its full-length glass panels all round. Its interior is bathed in vibrant colours – jazzy wooden chairs, pastel plushy cushions, and flashy wall decorations. Gazillions of colour pencils glued together to form the feature wall. Por Que No is family friendly too with a kids’ corner – there are Lego blocks, books, art materials, and toys to keep your little ones occupied. Children can play at the kids’ corner whilst adults can have good conversations without interruptions (ideally). Outdoor lounge with rooftop bar. Por Que No’s main goal is to consistently maintain the authenticity of Spanish tapas (i.e. its unique yet homey taste). The chef and her team take their craft seriously and ensure that all food served on the table sticks to its authentic taste as much as possible. 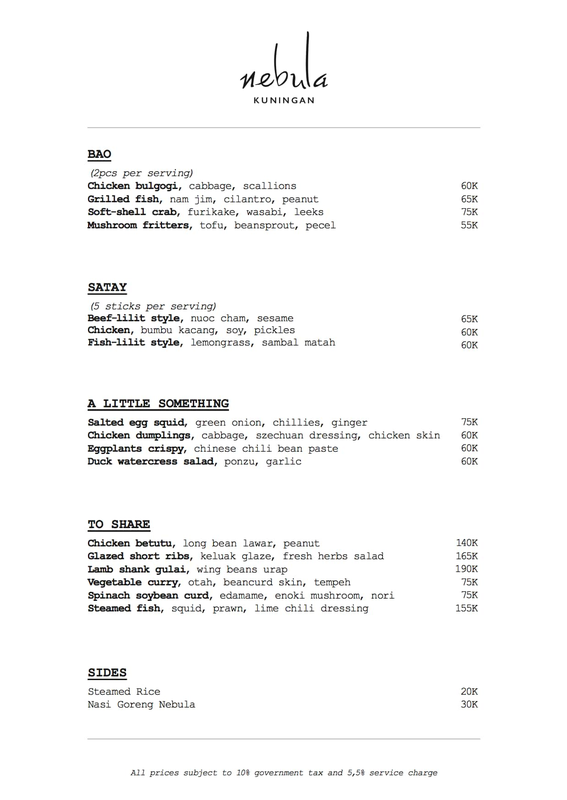 Because Por Que No is a tapas restaurant, its menu consists mainly of tapas (DUH) – small Spanish savory dishes. These little treasures of Spain were originally made to accompany drinks and to encourage conversation, because people are not so focused on eating an entire meal set before them. How ingenious! Berenjenas Fritas = fried eggplant chips with honey truffle. Really liked this one. The sweet and savoury coming together – SO GOOD! Huevos Rotos = broken runny egg topped with sliced potatoes and chorizo. A dish that seems so simple and basic yet tastes amazingly delish. Can’t go wrong with potatoes and eggs, I guess. Croquetas de Champiñones (IDR 40K). Croquetas de Champiñones = mushroom croquettes. This one was so-so only, in fact it tasted bland to me. Wouldn’t order it again. Biquini = serrano ham, cheese and truffle sandwich. Although there was nothing extraordinary about this dish, it was like comfort food to me. Reminded me of the ham and cheese sandwiches Milma used to pack for my recess back in primary school. The truffle oil was a nice addition. Oh, and check out their cool toilet sign made up of LEGO blocks. Since I’ve only tried four plates of tapas at Por Que No, I’ll def be back again to try the other dishes. And I happen to have a random paella craving now.